* The Stranger- A Tribute To Billy Joel. Trust Jeff Eats on this one, these guys will absolutely blow you away! THE STRANGER is the complete premiere tribute to the music of one of the world’s most beloved performers, Billy Joel. Comprised of some of the best and most experienced musicians in the business, this 6 piece band brings together an authentic replication of Billy’s timeless music, crowning it with soulful, spot on vocals that makes listening to a Billy Joel song so special. Out front on piano & lead vocals is founder & frontman Mike Santoro. Born and raised in Levittown like Joel himself, Mike not only looks and talks a lot like Billy, but has the piano chops, vocal prowess and stage presence of the Piano Man – so much so that you will soon forget you are watching a tribute show. 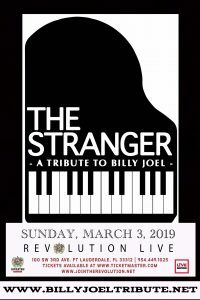 The STRANGER gives you the Billy Joel experience with the sound of his original band in its prime… energetic, interactive and often unpredictable. Its live entertainment at its best! From his radio hits to classic b-sides, sprinkled with great songs from similar artists such as Elton John, Paul McCartney and many others, it’s everything you’ll ever want in an evening out of great music.